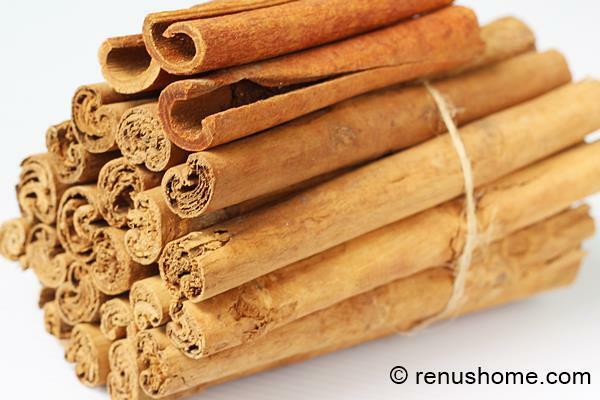 ceylon cinnamon – how to identify true cinnamon from cassia, a cheap and harmful variety. 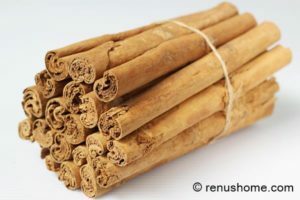 Little do many of us know that the variety sold in most super markets and grocery stores known as cassia is not the true cinnamon that can provide us the health benefits by using it in the right way. There are 2 kinds of cinamon. 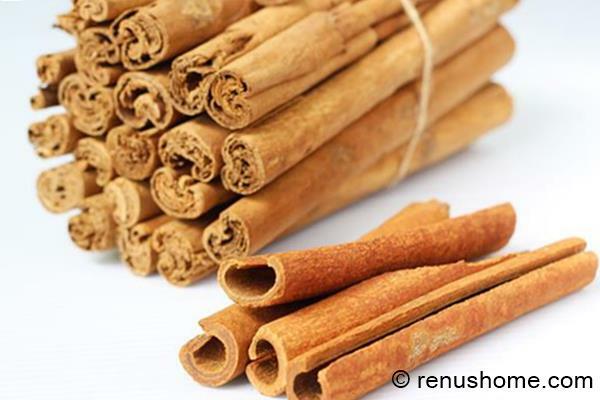 ceylon cinnamon known as “true Cinnamon” is different from the “cassia cinnamon” that is used by a larger population in the world and it also comes with risk. true cinnamon comes with lot of health benefits like regulating cholesterol levels, inhibiting the growth of fungus, expelling phlegm. While cassia may cause health hazards to liver and kidneys when used in a bit more quantity regularly. true cinnamon has a dominant, sweet, pleasant aroma and taste that can rob ones heart while cassia is pungent and has a sharp strong smell and taste. In the picture below, the top 3 thick barks are cassia and the bottom bundle of thin barks is true or ceylon variety. ceylon or true cinnamon is paper like thin and rolled to many layers and is quite fragile, is easily breakable. cassia is rough textured and is thick and just hard to break. It is rolled to only a few layers. true cinnamon is quite expensive and costs anywhere about 6 to 10 times the price of cassia. It has high medicinal properties and is used to heal certain infections and metabolic disorders while cassia comes with health risk when consumed in large quantities and is suitable only for occasional use for flavoring foods. The amount of coumarins is different in both the types. Coumarins are a plant component that exist in cinamon that can be toxic when eaten in larger quantities. True variety has a very small amount of coumarins while cassia has a much higher content which can take a toll over the liver and kidneys if consumed regularly. There is no way, one can find out whether the powder sold is made from ceylon cinnamon or cassia. Hence while buying the powder. It must be bought from trusted source or brand. 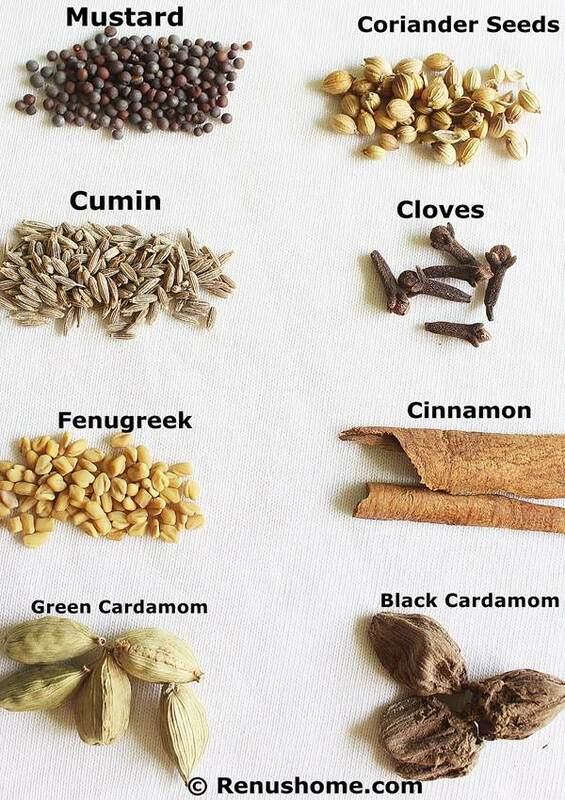 There are a lot of brands selling organic spices. To obtain the best health benefits, it is always best to buy organic ceylon cinnamon and then make a powder of it at home. It is always best to buy Ceylon variety and if possible organic yields the best flavors and health benefits. ceylon cinnamon can be identified easily. They are thin barks rolled to multiple layers and are quite fragile. 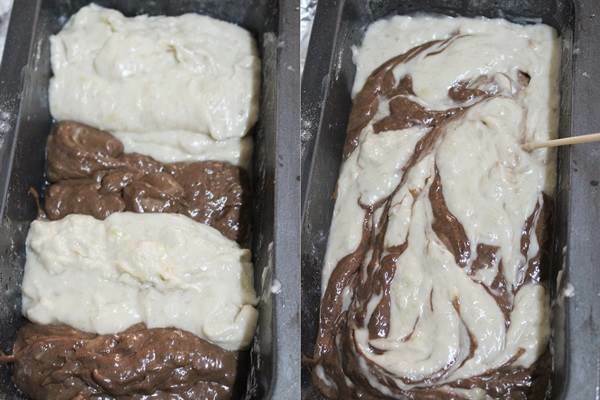 To make the powder, break open the layers, clean the inner parts of the bark with a clean kitchen towel or a dry cloth. Sun dry them for 2 hours. Any unseen creatures in the barks can be driven away by exposing to hot sun. 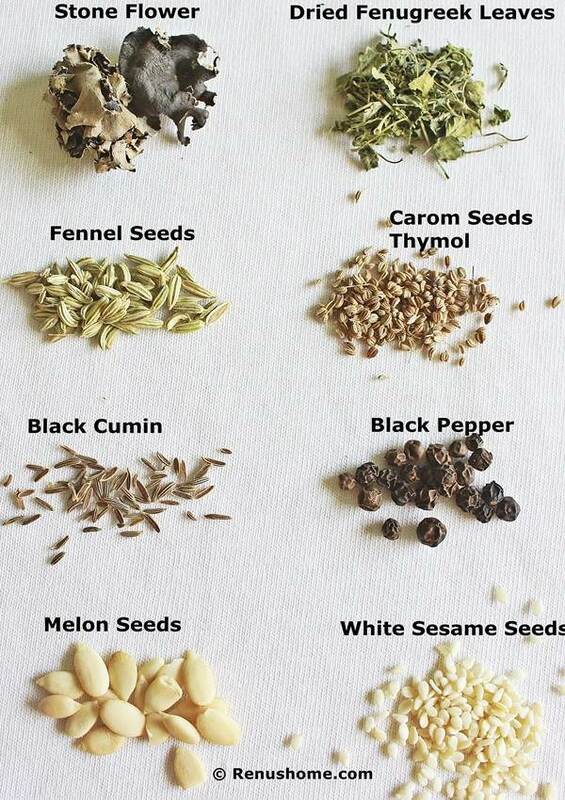 Sun dried spices are easy to blend as well. Break up to tiny pieces if your blender is not powerful enough. Add them to a blender jar and powder. Seive the powder using a filter or a fine mesh. Add the coarse particles to the blender again and powder it again. The coarse particles can be used to make tea. The smooth powder can be stored in a glass jar for further use. mysore bonda is very popular in south India mostly in Karnataka and can be found in tiffin centers, Udupi hotels and Restaurants. These have crusty outer skin while the inner part is very soft and light since they are made of yogurt and maida i.e plain flour. Also little rice flour is used to make the outer part crusty. These are quite popular as they are easy to make instantly and can be served as a tea time snack. They are different from the ulundu bonda (in tamil) or punugulu (in telugu) which are made of the urad dal batter. 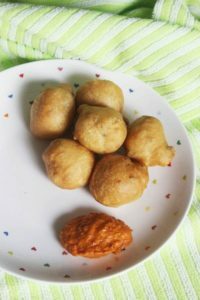 If you are looking for mysore bonda recipe that is served in Karnataka restaurants, you can try this. These mysore bonda are also called as maida bonda and maida punugulu. The proportion of rice flour can be adjusted a bit, but this works well for me. Theses taste the best when served hot or warm with a chutney. I prepare a onion tomato chutney or bell pepper chutney to go with them. 1. Dump all the ingredients except water and oil in a wide bowl. mix everything well. 2. 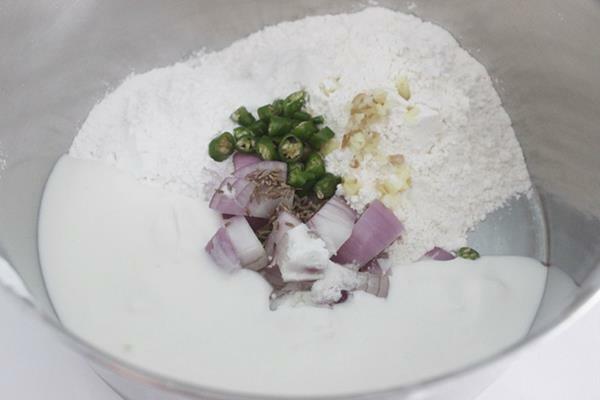 Add water little by little to make a thick batter like the vada batter. you can add little more flour if your batter becomes runny.set this aside for 30 minutes to 1 hour. 3. Heat oil well. Smear oil to your fingertips, make round balls and drop them in the oil. 4. Fry maida bonda till golden. Add all the ingredients, except water and oil to a bowl. Mix everything well. 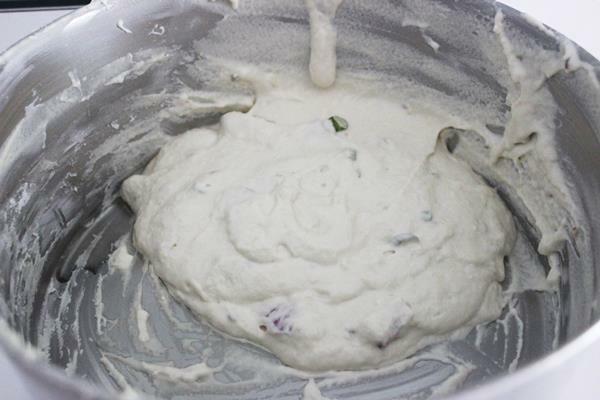 Add water little by little and mix to make a thick batter. The batter preferably must be of the vada batter consistency. So be cautious while you add water. If you happen to add more water and your batter ends up runny, just add little flour and mix. Use half rice flour and half maida while adding extra. Set this aside for 30 mins to 1 hour depending on your yogurt. If your yogurt is not sour, it is best to leave for an hour. Since sour yogurt makes these bondas fluffy and light. Heat the oil to smoke point, reduce the flame to medium. 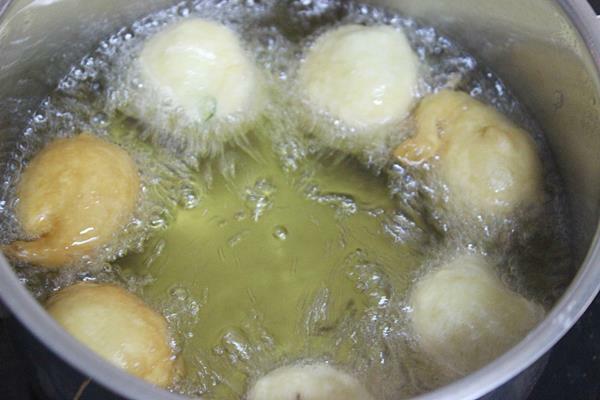 Smear some oil to your fingertips, make a round ball and drop in the hot oil. Fry till golden. Repeat smearing oil to your fingers every time you drop a bonda. This keeps them in good shape. Keep stirring with a ladle while frying otherwise these get discolored fast. Make them in batches till you finish all your batter. gajar matar ki sabzi or carrot green peas stir fry is a healthy, comforting and easy side dish that is accompanied with rice or phulka. This pair is so common and is liked by most, not only in the north but down in the south India too. It is one of the sabzis that is often served in the north Indian thali in Indian restaurants. Every week I prepare this sabzi with half a kilo of gajar and save it for the week nights dinner. Supermarkets in Singapore sell premium quality young frozen carrots from Australia, which are worth to adore. This gajar matar ki sabzi can be used to make kathi rolls for kids’ school lunch. This pair can be cooked in any way as one likes. Since I have a food processor, I prefer to grate the carrots, you can even chop to bite sized pieces. Grating reduces the cooking time and the sabzi is ready quickly. It can be made more nutritious and appealing by adding spinach, methi or crumbled paneer or fresh coconut. Refer the notes on how to use. 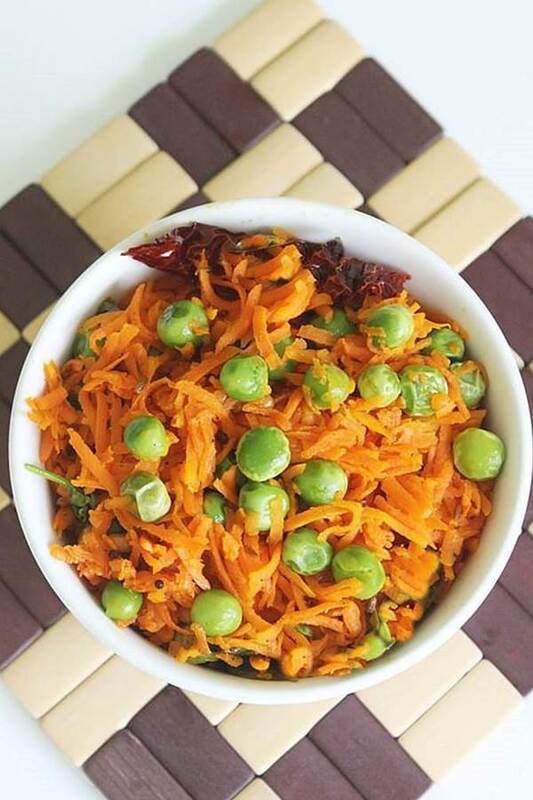 gajar matar sabzi is a carrot green peas stir fry , a comforting, healthy and easy side dish to accompany rice or phulkas. Add peas and carrots. Sprinkle salt and turmeric. Fry till the carrot is done. You can cover and cook for a while till they are done if the gajar or peas are not tender. Garam masala powder can be used only if carrot is cubed. With grated carrots, the sabzi tastes good without garam masala. coconut can be used to enhance the taste and flavor. If you like to use palak, methi or paneer with this, chop the leaves or crumble the paneer, add them at the end , cover and cook for 2 to 3 mins. A fruit, root, bark, seed or a vegetable substance that is in the fresh or dried form primarily used for flavoring is a SPICE. 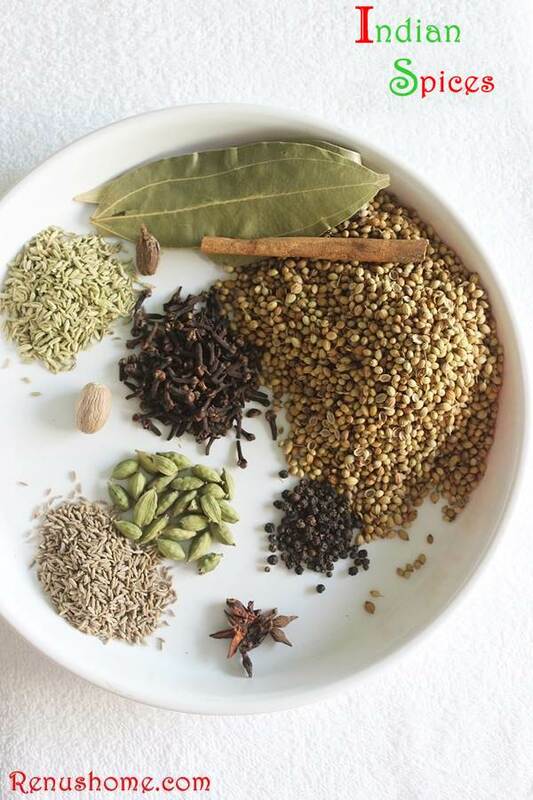 Spices are one of the most essentials of Indian cuisine. 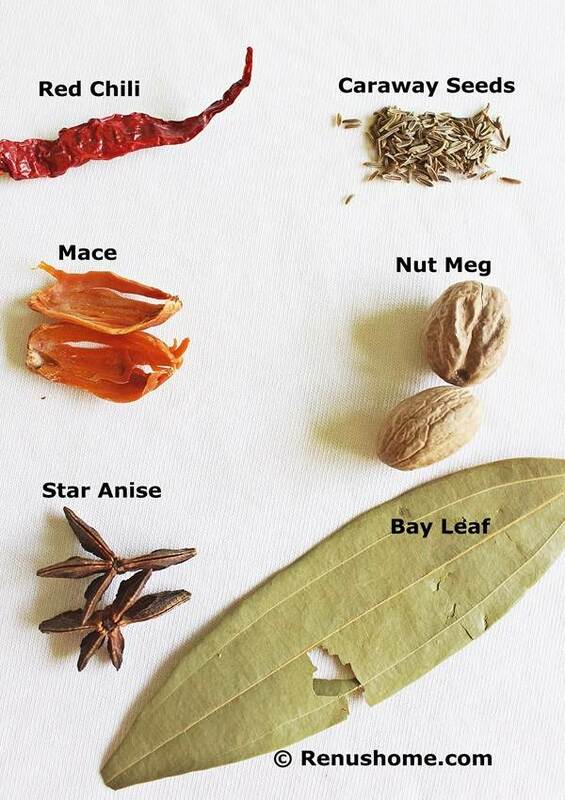 Most spices have their own medicinal and healing properties which have been trusted for centuries hence forth they are widely used in Indian Food. I have prepared a Glossary of Indian Spices in English, Hindi, Tamil, Telugu, Kannada along with the pictures of most of them. If you happen to know a spice that is not mentioned in the list below, you can contribute it here in the comments section. I would be more than happy to add your entry to the table. Thanks for stopping by and Welcome to Renus Home. This is my first post on this blog. 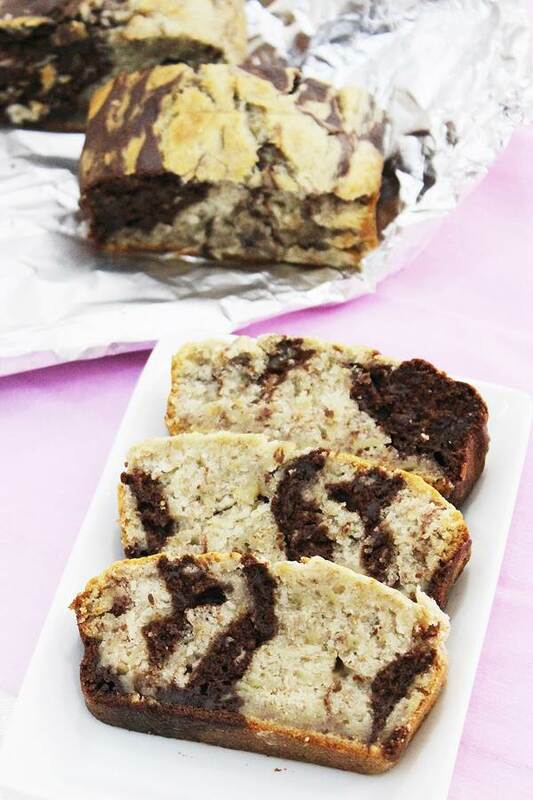 This Eggless banana cake is a welcome treat appreciating your visit here. 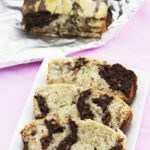 Banana and chocolate are made for each other and this combo makes the cakes moist and delicious that one would get addicted to. This Cake can also be made to a marble cake and is optional. It turns out to be fluffy, soft and delicious, all without using eggs. Mashed banana gives a moist and perfect texture to any cake. I try substituting mashed banana for eggs and it always works out for me except that the cakes or breads turn out to be slightly dense than the ones with eggs. First i will get you thru the step by step pictures. 8. Pour batters, starting with white batter and then alternately with cocoa mixed batter. Fill up the pan this way till all the batter is used up. 9. Swirl the batter lightly with a skewer to get a marble effect. 11. Leave it to cool for about 10 to 15 minutes and then transfer to a wire rack to cool. My Gorgeous looking eggless banana marble cake was ready to enjoy. This cake requires no frosting and tastes good on its own. Preheat the oven at 170 to 180C for at least 15 minutes. Mix flour, baking powder and baking salt and set aside. You could sieve them too. Mix cocoa to the other half of the mix. Take a skewer and then just swirl the batter lightly to give a marble effect. Do not overdo. 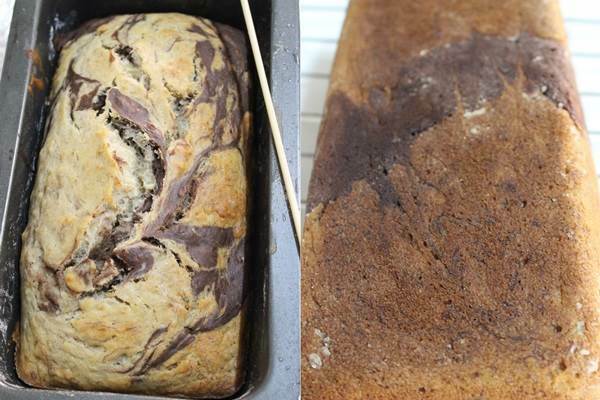 Cool the eggless banana marble cake for 10 to 15 minutes. Transfer to a wire rack. Cool it completely and cut. Tastes best the next day.